The earthquake devastated one of the world's largest collections of cultural heritage sites, turning some centuries-old monuments into piles of brick. 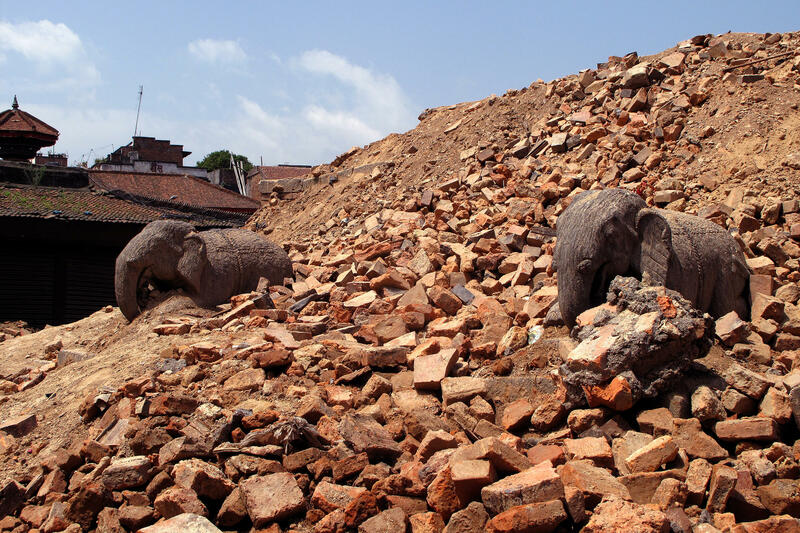 Two stone carved elephants look forlorn standing half-buried in the dusty debris of the monument they once guarded. The damaged royal palace of the Malla kings is among the many damaged historical structures. 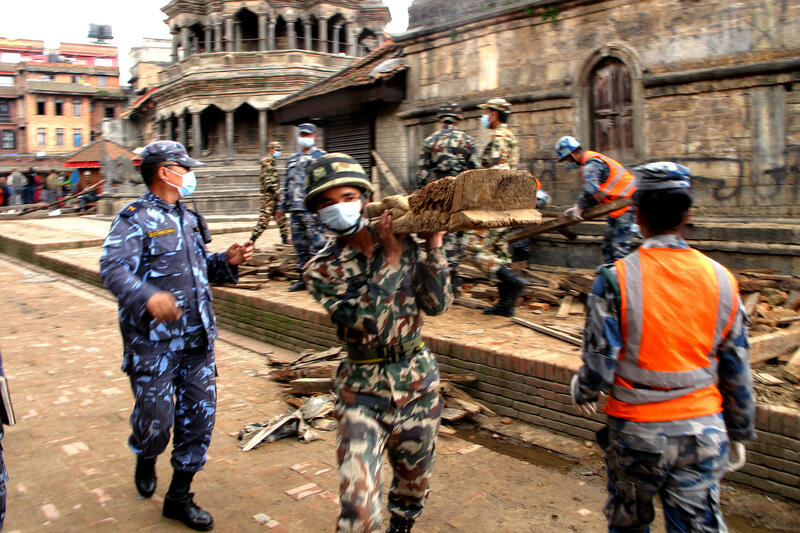 Uniformed police move wooden beams, stack broken bricks and sift through ruined monuments -- some of which date back to the 1600s -- in the city of Patan in the aftermath of Nepal's massive earthquake. Blue-uniformed police do the heavy lifting in Dubar square in the city of Patan, one of Nepal's oldest. Moving wooden beams and stacking broken bricks, they sift through ruined monuments, some of which date back four centuries and more. Nepal is home to one of the world's largest collections of cultural heritage sites. A considerable chunk of the treasures crumpled under the intensity of the seismic energy released by the quake nine days ago. Dubar Square in Patan is just one of three squares in the Kathmandu Valley designated as UNESCO sites and where centuries old monument were turned to piles of brick. 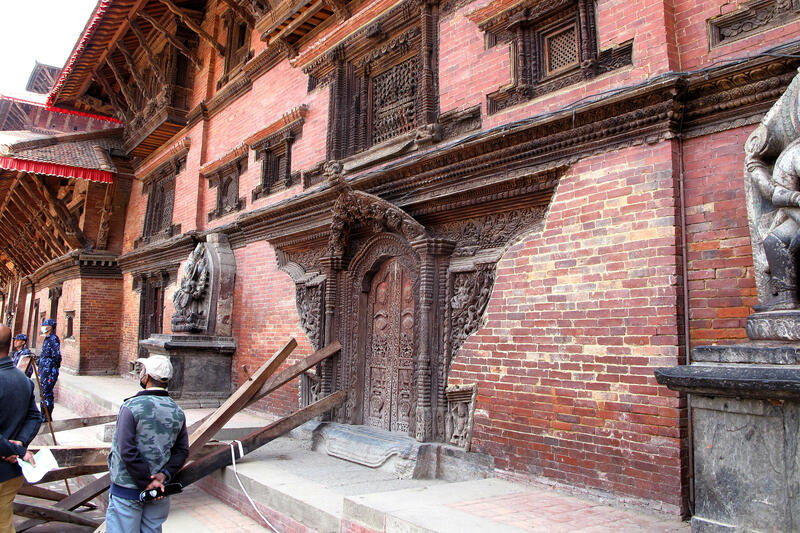 But Nepal has at its disposal a tradition stretching back generations that can help restore the country's architectural heritage and which is found in the shadow of Patan's Dubar Square. The Kathmandu Valley Preservation Trust has saved over 50 historic buildings over the past two decades, since its founding by Harvard architectural historian Eduard Sekler. Restorations include the courtyard that is a central attraction in Patan square, says trust country director Rohit Ranjitkar. The square has been a preservation priority, Roht says, because it represents a living breathing public space. He says the local community uses the former royal complex today to worship, contemplate or socialize. "You can easily break the new bricks, but these bricks are still hard to break," he explains, pointing to a pile of bricks from a damaged monument that dates to 1563. "You can still see there is lots of damage, but the brick is not warn down." "We are Buddhists," says Brahmacharya, but he is quick to assert that "art is my religion," and that sharing Nepal's unique art is his passion. 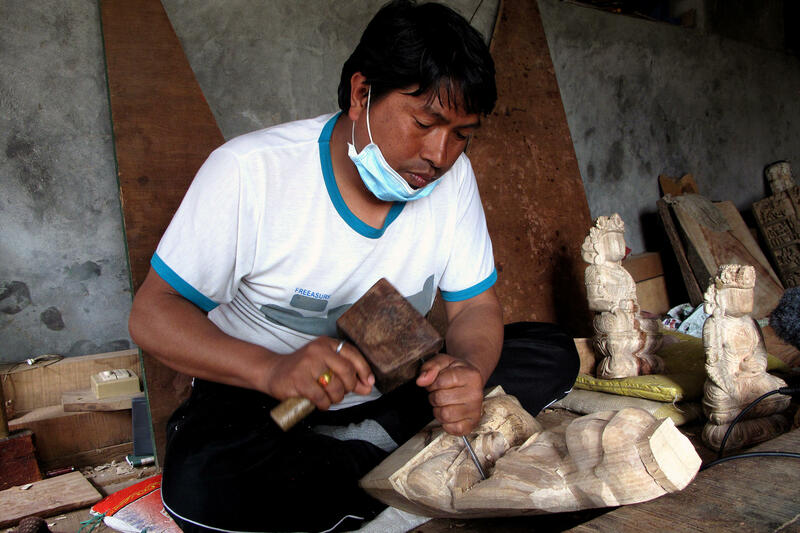 The master carver is a member of Nepal's indigenous community, or Newar, the carving class even today. We're going to focus now on the cultural devastation caused by that recent earthquake in Nepal. The quake destroyed one of the world's largest collections of cultural heritage sites, turning some centuries-old monuments into piles of bricks. Preservationists say Nepal just doesn't have the money to repair the damage. But what the country does have is a unique tradition stretching back generations that can help restore its architectural treasures. From the Kathmandu Valley, NPR's Julie McCarthy has the story. JULIE MCCARTHY, BYLINE: Blue-uniformed police do the heavy lifting in Dabar Square in the city of Patan, one of Nepal's oldest. Moving wooden beams and stacking broken bricks, they sift through ruined monuments, some of which date back to the 1600s. A considerable chunk of Nepal's cultural heritage crumpled under the intensity of the seismic energy released by the quake nine days ago. This square houses a dizzying array of pagodas, steep-stepped Hindu temples and Buddhist shrines. Two stone-carved elephants look forlorn standing buried in the dusty debris of the monuments they once guarded. Across from them sits the damaged royal palace of the Malla kings, credited with founding this square. Rohit Ranjitkar is the country director for the Kathmandu Valley Preservation Trust. The trust has saved over 50 historic buildings, including the courtyard that is a central attraction in this square. Ranjitkar says this former royal complex is today the gathering place where people come to worship, contemplate and socialize. ROHIT RANJITKAR: It's not like a Roman Forum. If you go to Roman Forum, you see mostly tourists. Here, you see mostly local people. This is our identity, our pride, so we have to repair it. We have to bring back the square in the same condition. MCCARTHY: Any restoration would be a huge recycling project. As Ranjitkar says, the preference is to use the old rather than new materials. RANJITKAR: You can easily break the new bricks, but these bricks are still hard to break. MCCARTHY: How old were those bricks? RANJITKAR: These are the same period as the temple, 1563. And you can still see there are lots of damage, but still, the brick's quality is not worn down, you know. So this is the quality, what they produced at that time. MCCARTHY: Standing amid the rubble, it's hard to imagine this place restored. But meet Ratna Muni Brahmacharya. MCCARTHY: He sits cross-legged in his workshop that is infused with a subtle scent of camphor, a rare wood he's using to carve a Buddha. Nepali carvers, Brahmacharya says, have passed their skills down through the ages. He's traced his lineage back 2,400 years. That's the time historians say Buddha would've been born in what is now modern-day Nepal. We are Buddhists, says Brahmacharya. But art, he says, is his religion. The master carver is a member of Nepal's indigenous community or Newar, the carving class even today. RATNA MUNI BRAHMACHARYA: (Foreign language spoken). MCCARTHY: He says his forefathers were involved in building the palaces and monasteries of Patan with its square now in ruins. Nepali architecture beguiles with its intricate carvings. Gods, dragons, snakes and suns feature on the doors and roof tops of Nepal's royal and religious buildings. The distinctive wood-latticed window was thought to keep out those who meant harm. Today, 50 to 60 members of Brahmacharya's family are in the trade, carving wood, stone, bone and metal. 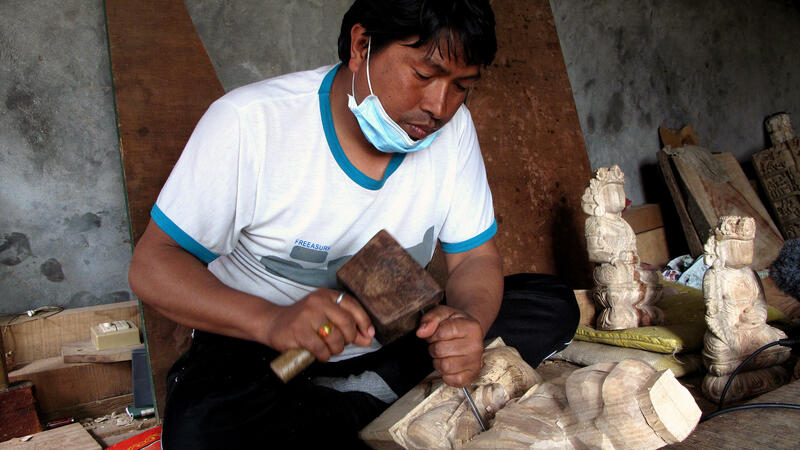 The 42-year-old craftsman, schooled by his uncles, says he has trained some 500 young carvers. MCCARTHY: "I'm now successful sending my products around the world," he says. "The important thing to do now is impart my knowledge to young people so that they join this profession and preserve our ancestors' legacy." 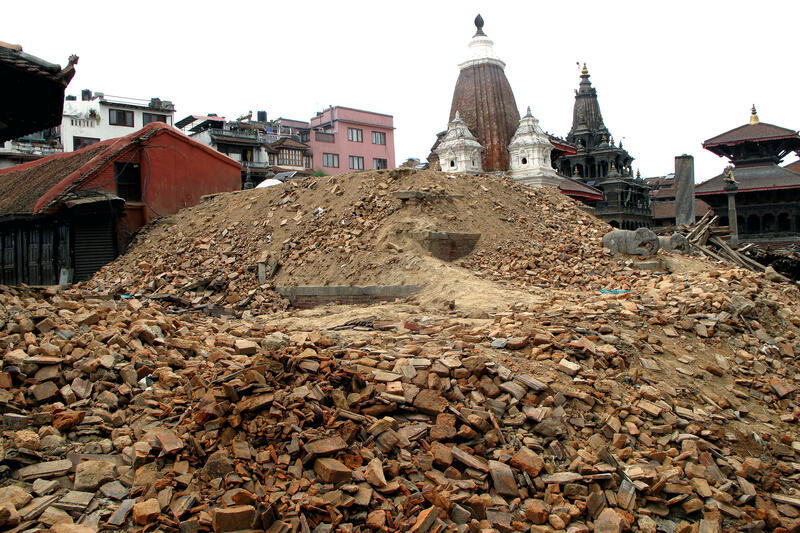 Brahmacharya says Nepal must reinforce its vulnerable monuments. MCCARTHY: "We have lost part of our heritage, but our culture is still intact," Brahmacharya says. "We have the knowledge and the expertise. We can revive our heritage." Julie McCarthy, NPR News, Patan, Nepal. Transcript provided by NPR, Copyright NPR.